Termites can cause billions of dollars in damage each year. They primarily feed on wood, but they also damage paper, books, insulation, and even swimming pool liners. Although buildings may become infested at any time, termites are of a particular importance when buying or selling a home. A termite inspection (Wood Destroying Insect Report) is normally a condition of sale. The possibility of thousands of winged termites emerging inside one’s home is an emotionally trying experience, not to mention the thought of termites feasting on one’s large investment. Spring is typically when large numbers of winged termites can emerge inside homes. These are called swarmers. Termites swarm to disperse and start new colonies. Due to warm temperatures and rainfall, the winged termites emerge from their colonies and fly into the air. The swarmers will drop to the ground, shed their wings, pair off with a mate. They attempt to begin new colonies in the soil. Very few swarmers that emerge outdoors survive to start new colonies. Although swarmers found indoors are incapable of eating wood, seldom do survive. It’s best to remove them with a vacuum cleaner. Swarmers found inside a home does indicate that an infestation is present. Finding winged termites indoors almost always indicates that an infestation is needing treatment. People often confuse winged termites with ants, which swarm at the same time of year. Termites bodies are different from those of an ant. Termites have straight antennae, a uniform waist and wings of equal size. Ants have elbowed antennae (bent), constricted waists and top wings that are longer than the bottom wings. Termite swarmers are attracted to light. They are often seen around windows and doors. They can also been seen coming from tree stumps, woodpiles, and other locations in the yard are not necessarily cause for a concern. This also does not necessarily mean that the house is infested. Although, if winged termites are seen emerging from the base of a foundation wall or adjoining porches and patios, there is a potential of an infestation. Termite treatment may be needed. Other signs of infestation are mud tubes extending on top of foundation walls, support piers, floor joists, etc. Mud tubes are typically about the diameter of a pencil, but sometimes can be thicker. Termites make these tubes for shelter as they travel between their underground colonies and the structure. 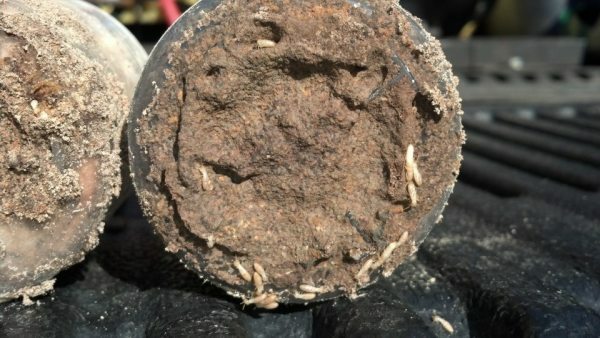 To help determine if an infestation is active, the tubes may be broken open and checked for the presence of small, creamy-white worker termites. If a mud tube happens to be vacant, it doesn’t mean that the infestation is inactive. Termites will often abandon sections of mud tubes while foraging elsewhere in the structure. Sometimes termites create tiny holes in the plaster or drywall. Ripples or sunken traces behind wall coverings can also be indicative of termites tunneling underneath. Usually there won’t be any visible indication that a home is infested. Termites are mysterious creatures and their infestations can go undetected for years. They can be hidden behind walls, floor coverings, insulation, and other obstructions. Termites feeding and the damage can even progress undetected in wood that is exposed because the outer surface is usually left intact. Termite control utilizes specialized equipment such as masonry drills, large-capacity tanks, and soil treatment rods. A typical treatment may involve hundreds of gallons of a liquid pesticide, known as a termiticide. Termiticide is injected into the ground alongside the foundation, beneath concrete slabs, as well as foundation walls. To be quite honest with you, termite treatment is a job for professional pest control . There are TWO general categories of termite treatment: liquids and baits. Soil-applied liquid termiticides have been around for decades. The purpose of a liquid treatment is to provide a long lasting chemical barrier that will keep termites in the ground from entering buildings. In most cases, termites already in the structure die off as well because they cannot return to the soil. The chemicals used are non-repellent, therefore, termites tunneling into the treatment area are unaware that they are being killed. The non-repellent products are proving to be more reliable in their ability to resolve termite problems in the first attempt. The other broad treatment category is Termite bait treatment. Termite baits consist of paper, cardboard, or other palatable food, combined with a slow-acting substance lethal to termites. Termite bait stations are installed below the ground in the yard, in cylindrical plastic stations. Foraging termites will consume the bait and share it with other termites in their colony, which will result in a gradual decline in the termite colony. On some properties, baits may constitute the only form of treatment, while on other property, they may be combined with liquid applications to areas where termites are being observed. All liquid termiticides are supposed to control termites for at least five (5) years when applied according to label directions. The actual length of control on a given structure will depend on various factors such as: thoroughness of the application; environmental conditions; and the density of termite colonies in the area. If termites swarm again and continue to be a problem the year after treatment, it’s usually not from degradation of the termiticide but because termites have found an untreated gap in a chemical barrier. Let’s be clear, termite control involves LIVING CREATURES. The best treatments performed by knowledgeable pest control firms may fail at times because the ground where a chemical barrier had been applied was disturbed. (Ex: digging up the soil to plant flowers or removing shrubs, plants, etc) Also with the use of bait stations, if they are dug up and not replaced properly due to creation of flower beds, porches, etc, there will be a large gap between the stations to help with the control of termites as well. Therefore, termites can find their way through tiny, untreated gaps in the soil. Ants are very common insects. There are more than 10,000 known ant species around the world. Ants are especially prevalent in tropical forests and may make up to half of all the insects living in some locations. Ants look like termites and the two are often confused, especially by homeowners who are worried about termites. Ants, however, have a narrow “waist” between the abdomen and thorax, termites do not. Ants also have large heads, elbowed antennae, and some powerful jaws. Ants usually live in structured nest communities that can be located underground, in ground-level mounds, or in trees. Carpenter ants nest in wood and can be very destructive to buildings. Some species of ants do not have permanent homes, instead they seek out food for their enormous colonies during periods of migration. Ants communicate with each other by using chemicals that can alert other ants to danger or lead them to a promising food source. Ants typically eat nectar, seeds, fungus, or insects. However, some species of ants may prey on reptiles, birds, or even small mammals. So what can you do to prevent Ants from invading your home? First, ants can enter through the tiniest of cracks and crevices seeking out water and food sources. So be sure to seal up those cracks and crevices. Secondly, ants leave scent trails so other ants can be lead to the food source others have found. Be sure to clean up the sugar and creamer area around your coffee makers. Ants really love those areas. Also, clean off the counter tops and behind the faucets on your sinks. Sometimes food particles will get behind there and can become a good food source for ants. Lastly, look around the perimeter of you home and in your yard. Do you see any mounds or old tree stumps? If you do, make sure to remove the old tree stumps. Treat the ant mounds directly by sprinkling ant bait around the mounds, not on top. Prevention is the key to all your pest problems, even ants. It might be snowing, ice on the ground, or raining like we live in the Rain Forest. This does not mean that termites are inactive. They are still foraging, looking for food such as wood siding that’s been soaking up water because it’s come in contact with the damp soil. Be on the look out for suspicious mud tubes on the side of your home. It could be termites, even in these winter months.